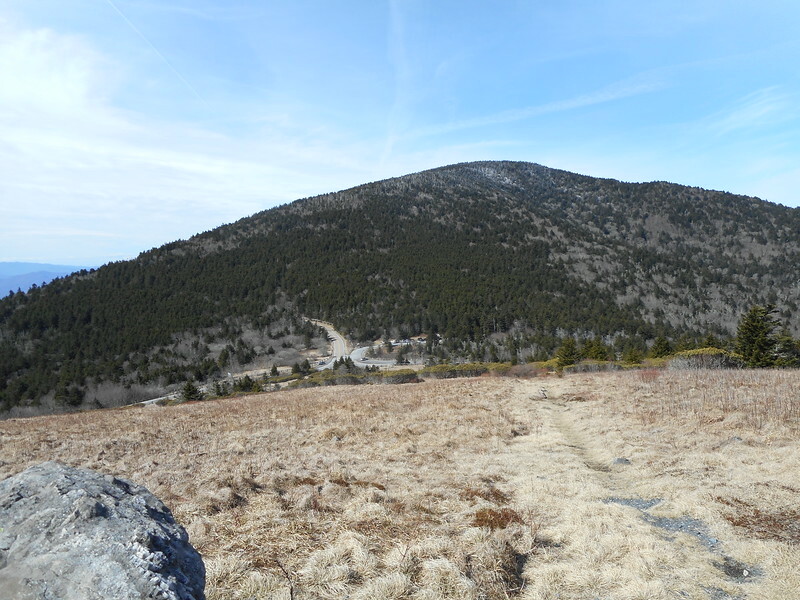 When I did my March Section Hike from Sams Gap to Dennis Cove, I made a decision to skip the section between Carvers Gap and Route 19E. 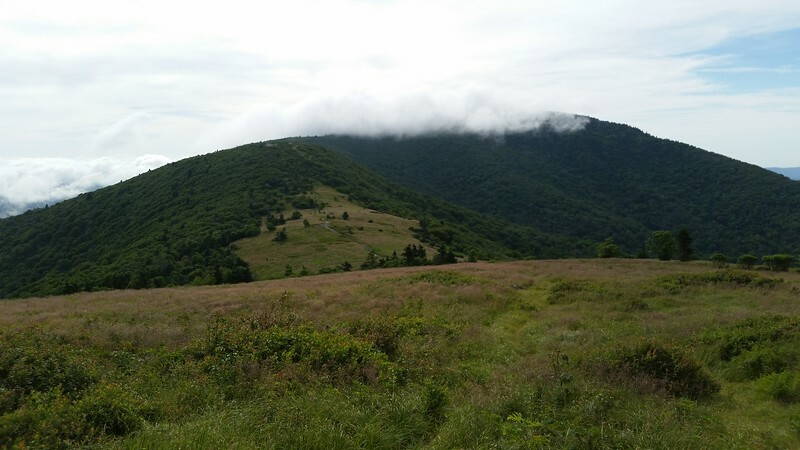 One of the reasons was that I wanted to bring my daughter out to the AT and this seemed like a slam-dunk eye candy addicting section that could be done either as an overnighter or as a long day hike. We opted for the latter and met up at the Mountain Harbour B&B on July 1st so we could get an early start on the morning of the 2nd. As a warm-up, we drove up to Carvers Gap that evening and continued up to Tollhouse Gap near the site of the former Cloudland Hotel. 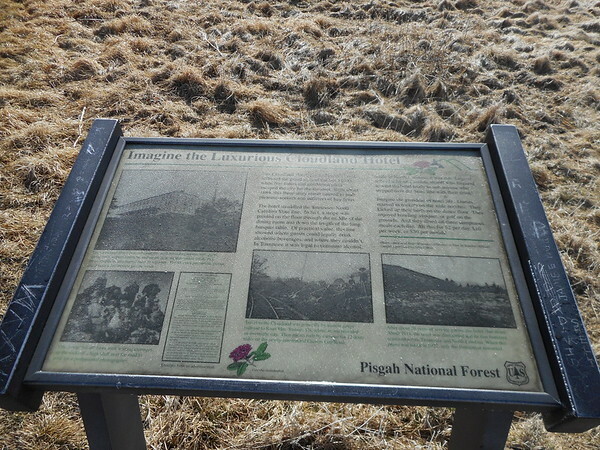 I had been so damn tired after climbing up the south side of Roan that I didn't even poke my head out of the pines to see the marker for the hotel site or realize that there was a road and parking lot a mere 50 yards from the AT. Smoking Sox was kind enough to take this picture for me. 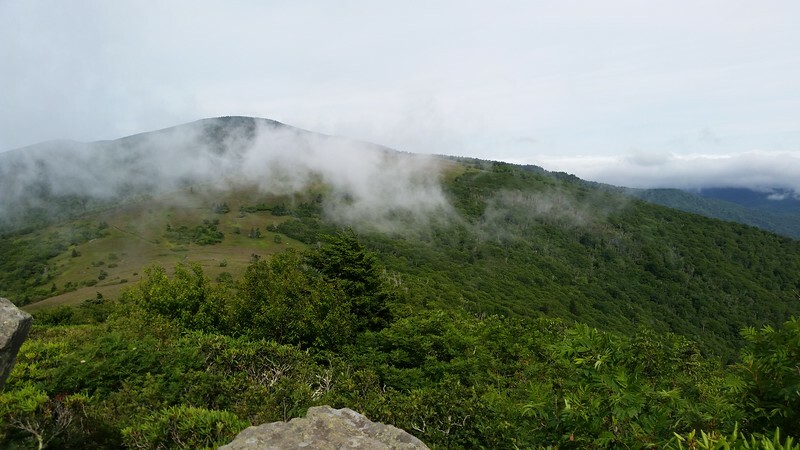 It had been raining near the Roan summit as we drove to Carvers Gap, but the sky looked like it would give us enough time to do a quick trip to the Roan High Knob shelter. 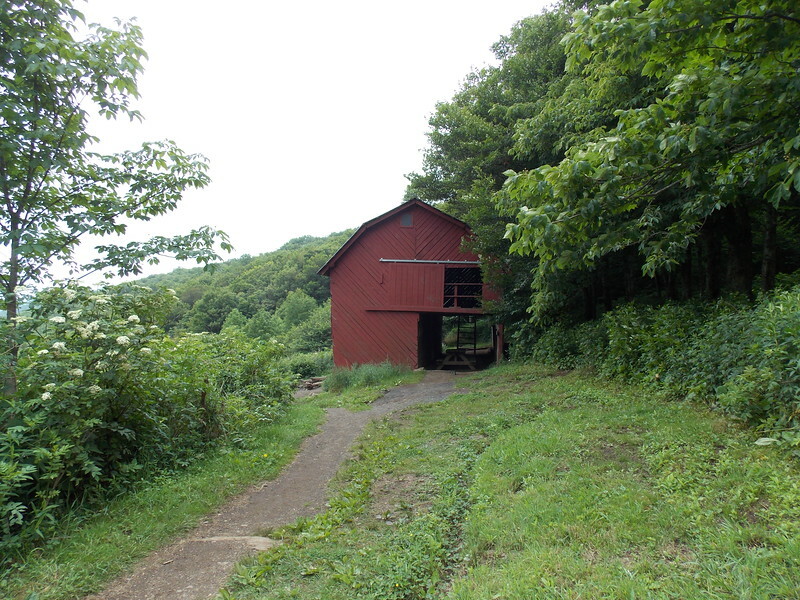 It was an easy walk and we soon came to the shelter side trail. 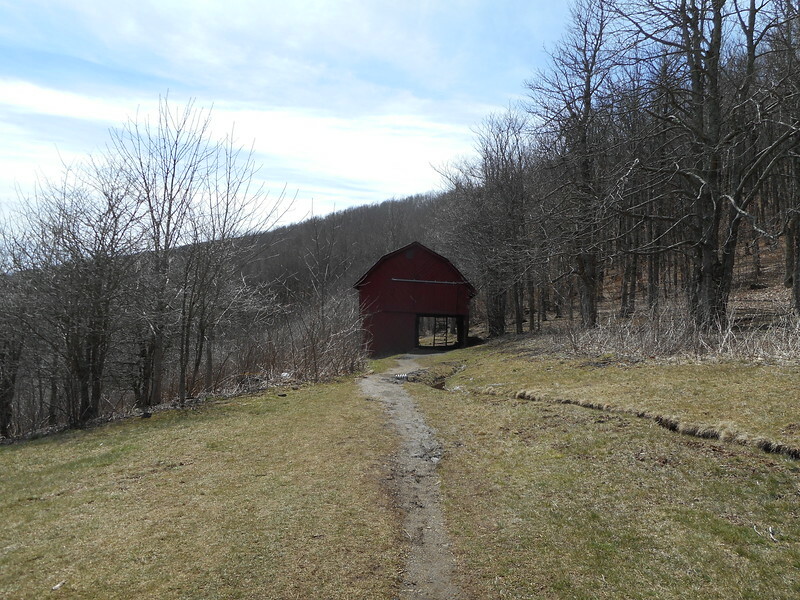 I took a break here here in March with nothing but ice covering both the AT and the side trail. Up at the shelter, there were five section hikers, one who happened to be from a neighboring town. The couple in this picture were headed northbound and we ended up flip-flopping with them quite a few times the next day. We took a quick side trip to the actual high point, then beat feet back to the vehicle under darkening skies. Rain started falling as we passed the Cloudland marker sign so we made it back to the car without getting soaked. 30 minutes later, we were back at the B&B drinking a few beers on the porch, then turned in early to get a good night's sleep. We got up early this morning so we could get our day packs arranged and pre-hydrate. Breakfast was served just before 08:00 out at the food trailer (more on this later) so we were fed, watered and ready for departure around 08:30. 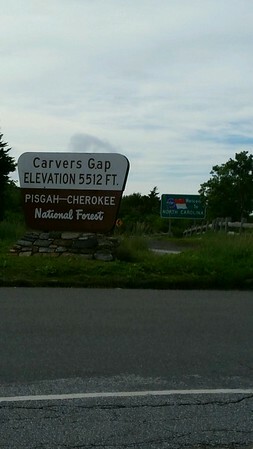 At 08:52, we parked in Carvers Gap and started up Round Bald. The ascent was exceptionally well graded - we found ourselves looking back into the gap without breaking a sweat. Wherever possible, I will post pictures that Smoking Sox took last March with my current pictures to show the difference between winter and summer views. 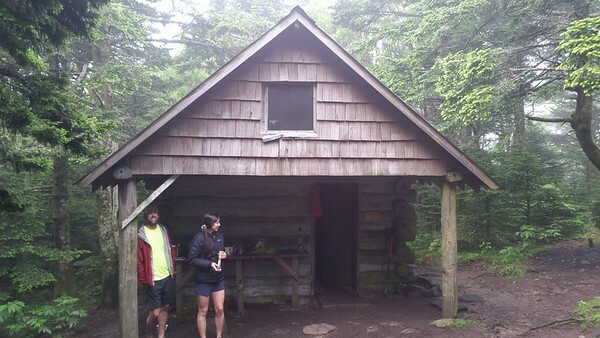 We ran into a group of NC State students who were camping near the summit of Round Bald. It would be easy to carry campground-type equipment up here from the gap and have a very comfortable & scenic spot to spend a weekend. The summit views were outstanding. 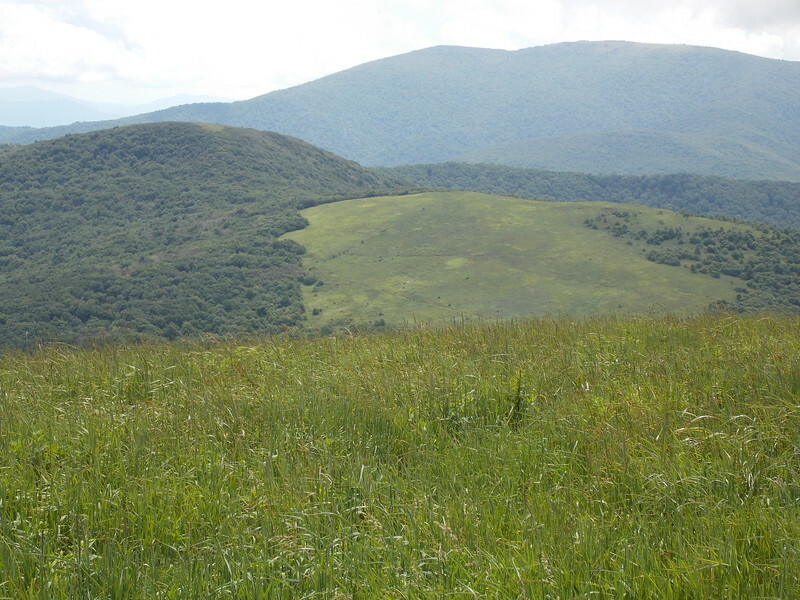 The views from Jane Bald were just as impressive. 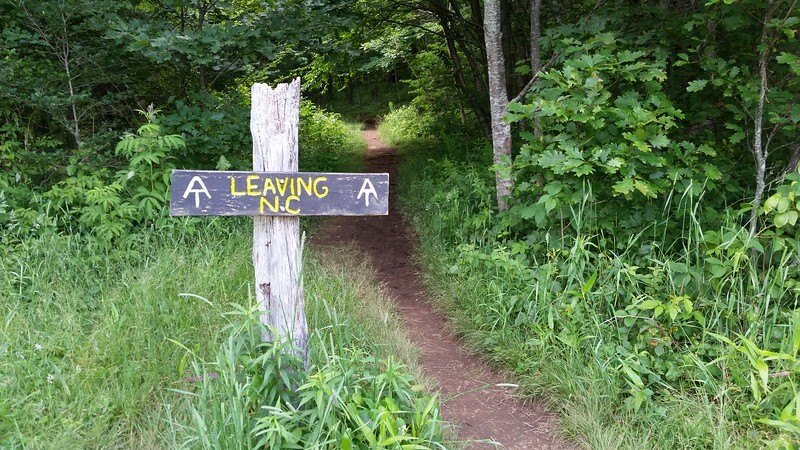 The NC State students had recommended the 1-mile round trip along Grassy Ridge but we opted to skip it based on our intended 16+ miles and the desire to arrive back at Mountain Harbour in time to catch dinner at the food trailer. 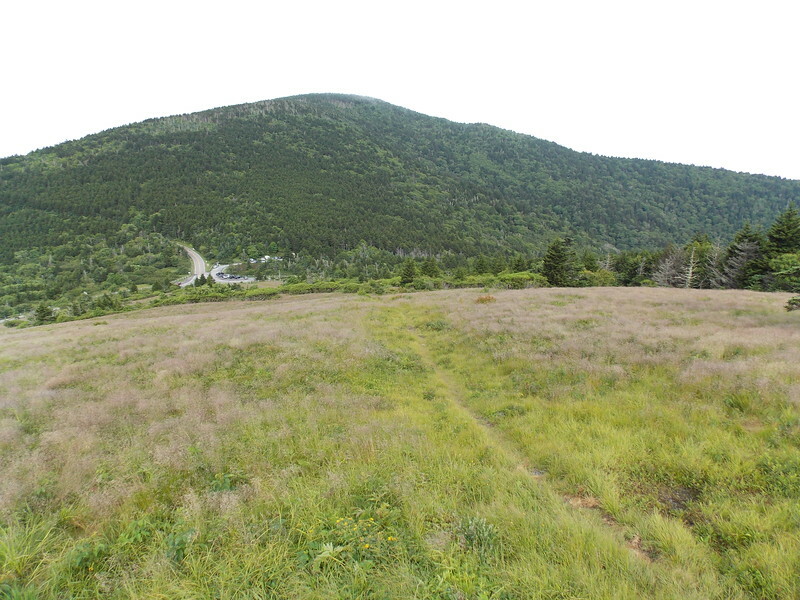 So we took the left turn onto the AT just before Grassy Ridge and descended towards the Stan Murray shelter. Our stop at the shelter was brief - just enough time to eat a few snacks as the clouds passed through the woods around us. 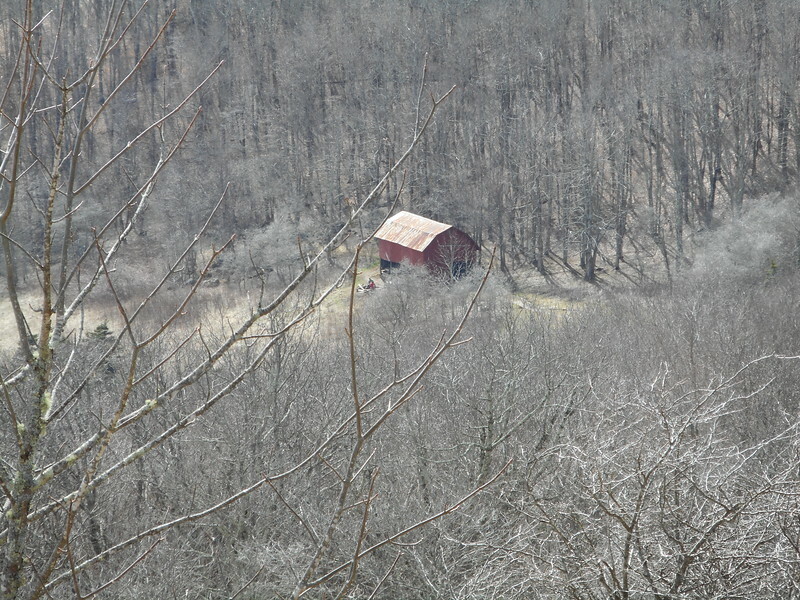 Then we continued onto the Overmountain shelter. The 1.9 miles between the shelters passed by in record time. Nothing like a day pack and a gentle descent to crank out miles. 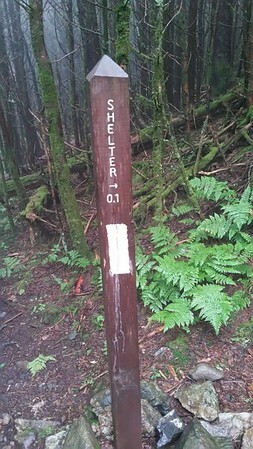 The shelter trail was not marked in the same fashion as most AT shelters. Instead, there was a marker sign with instructions to descend to the right and keep taking the right-most trail at each split. Those instructions worked just fine and led us to the barn in time for lunch. We ran into the couple that we photographed at the Roan High Knob shelter last night. They were trying to decide if they wanted to spend the night here or push for Route 19E. I told them about the AT Double Cheeseburgers at Mountain Harbour and could see the look in their eyes. Something told me we would see them later in the day... And before I forget, the open-air privy at the Overmountain shelter is a thing of beauty. Three-sided half walls and bejeweling on the lid. Very classy, and the lack of an enclosed structure makes for an odor-free experience. The post was edited 1 time, last by StalkingTortoise ( Jul 5th 2017, 11:14am ). Now for the fun part of the hike. 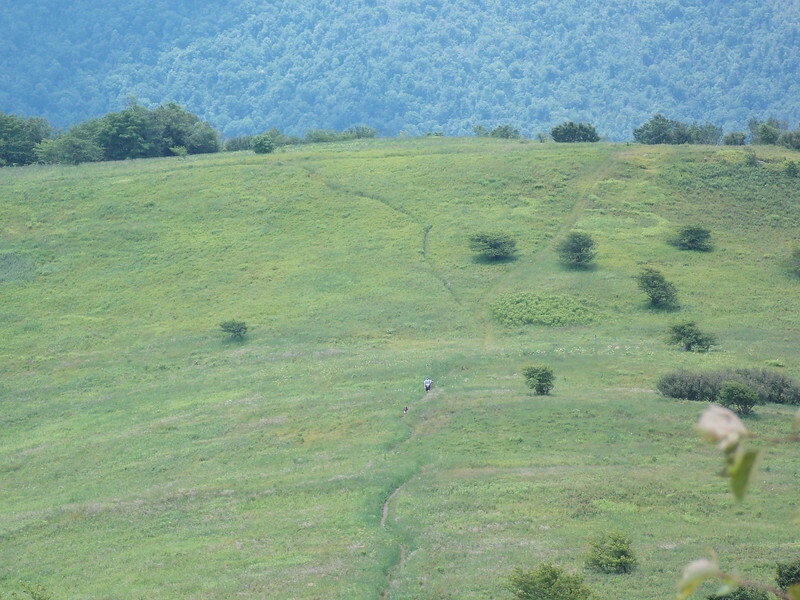 We had the ascent of Little Hump and Hump,then the long descent to Route 19E over the remaining 9.2 miles. The sun was beating on us as we climbed up the ridge towards the summit of Little Hump. Fortunately, the views kept us distracted. The breezes on Little Hump did wonders to wick away the sweat. We took another break on the big rocks near the summit and watched other hikers following our footsteps. 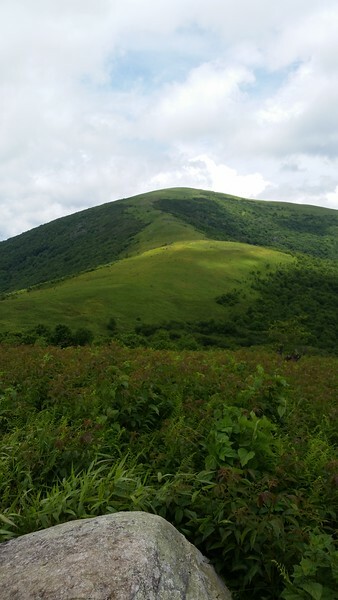 As we departed the summit of Little Hump, we got our first view of Hump. It looked close enough to touch. And with each step forward, it got even closer. 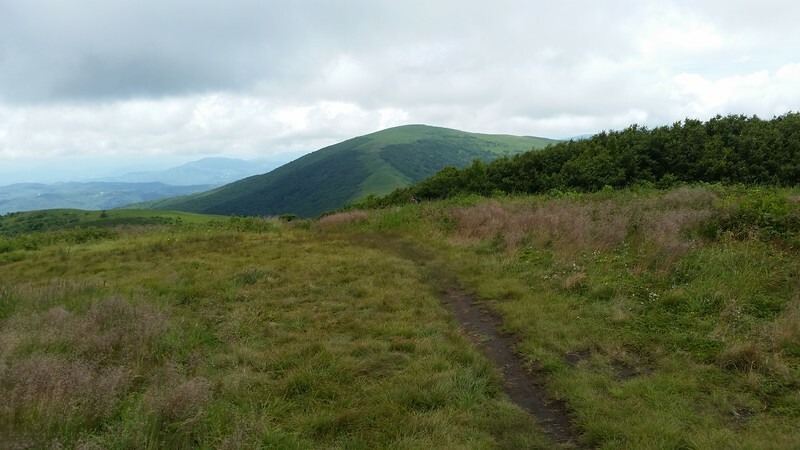 At the summit, the view back towards Little Hump was totally dominated by Roan Mountain. At this point, there was nothing but descent with very few views. We made a quick stop for water from the piped spring near Doll Flats then pushed hard over the remaining 3 miles to get back in time for dinner. We made it to Route 19E at 17:20, covering the 16+ miles in 8.5 hours. 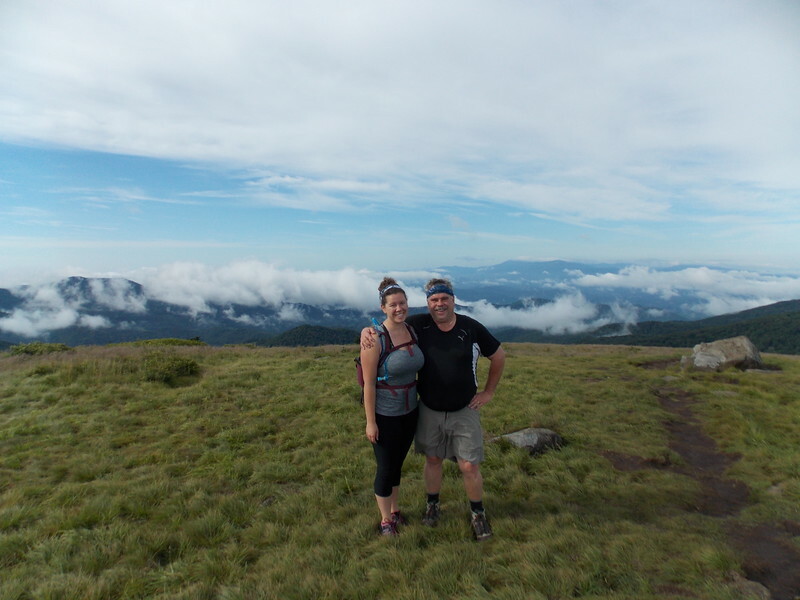 Back at Mountain Harbour, we met up with the couple from the Overmountain shelter and saw that they had taken my food advice. 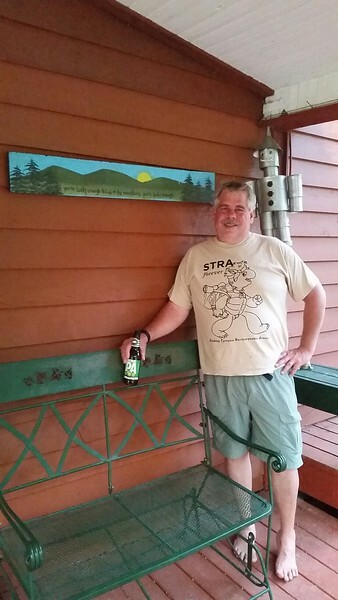 After showers, burgers, chili cheese fries and plenty of re-hydration, we took our second vehicle back to Carvers Gap, retrieved the first vehicle, then enjoyed a few brews in the rocking chairs on the B&B front porch. The perfect ending to a perfect day! The post was edited 1 time, last by StalkingTortoise ( Jul 5th 2017, 10:05am ). 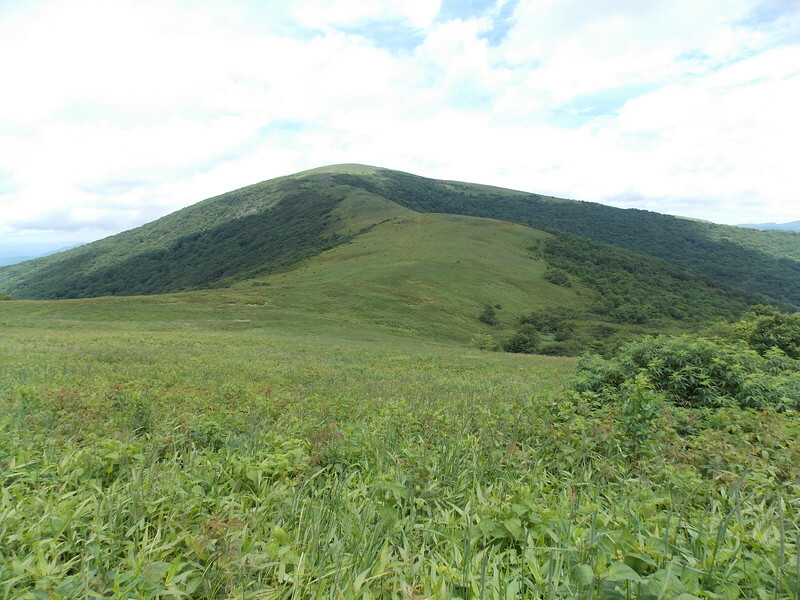 This would be a great 2-day section hike with an overnight at the Overmountain shelter. 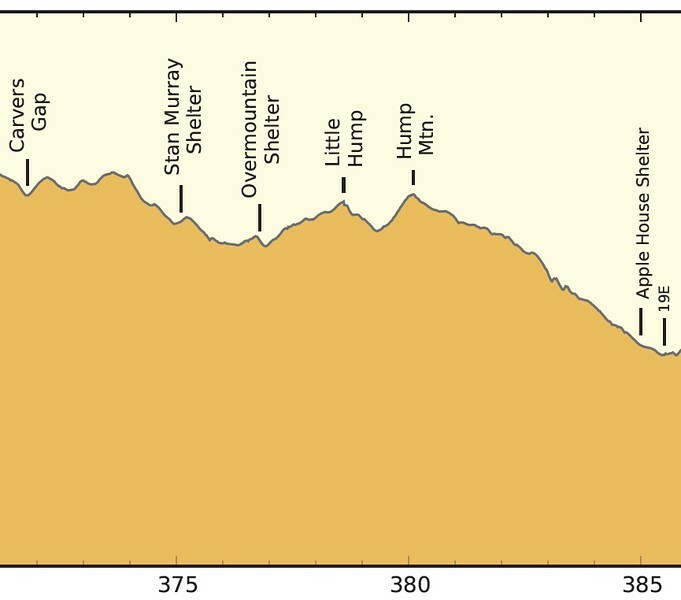 Fairly easy terrain to the shelter on Day 1, then a lighter pack for the Hump climbs and descent to Route 19E on Day 2. Mountain Harbour runs shuttles to Carvers Gap and charges a reasonable daily parking fee for safe parking on their property. Their breakfast is very good and worth the $15 if you have a good appetite. 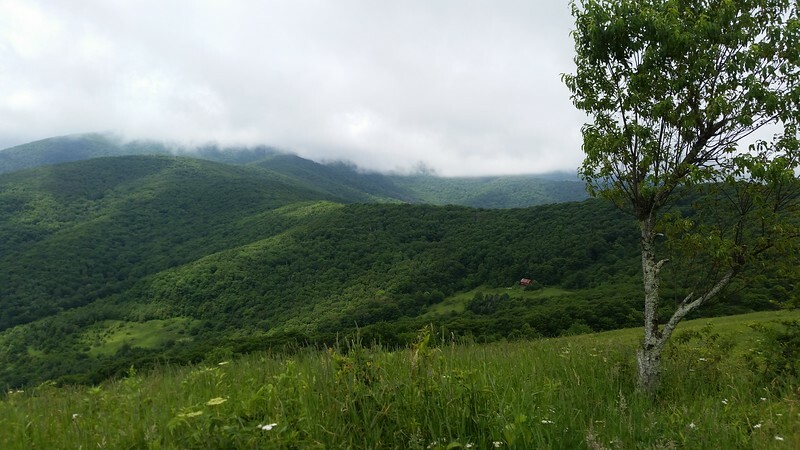 The hostel is also a good lodging option for the night before or after your hike. I found the B&B room to be comfortable, but a little pricey. My room (two beds) was $145 / night with a shared bathroom. Here's the new twist with breakfast. Up until recently, a full breakfast spread was laid out in the kitchen of the house for B&B guests, hostel dwellers, campers and anyone else who hiked in. Silverware, plates, coffee mugs and indoor seating. Then a TN health official knocked on the door. I'm told that the nearby hostel competitor tried to sabotage the Mountain Harbour hostel by alerting State officials that a home kitchen was being used for commercial use. The State of Tennessee gave the owners two options - move out so that no pets live in the house or use the certified commercial kitchen in the food trailer. So now, there is a big tent outside the food trailer and breakfast is served out of the trailer on paper plates with plastic cutlery. Not a big deal if your in the hostel or camping area, but a little cheap if your dropping $125 - $165 for a B&B room. My daughter is hooked on hiking the AT. Mission accomplished! She's slowly gathering up her gear and this hike gave her an idea of which items should be added next. Hopefully, she can join Smoking Sox and I next spring as we work on the remaining 208 miles of the southern AT. Almost every state has adopted the USDA's food code. Bed and Breakfasts have very specific rules and pets are not allowed unless the Food segment (prep, storage and service) is isolated from the lodging portion. Even service animals are excluded from the prep area. That's one of my favorite places to hike. Thanks for sharing. I usually get there on a fri evening, so I stay on roan high. 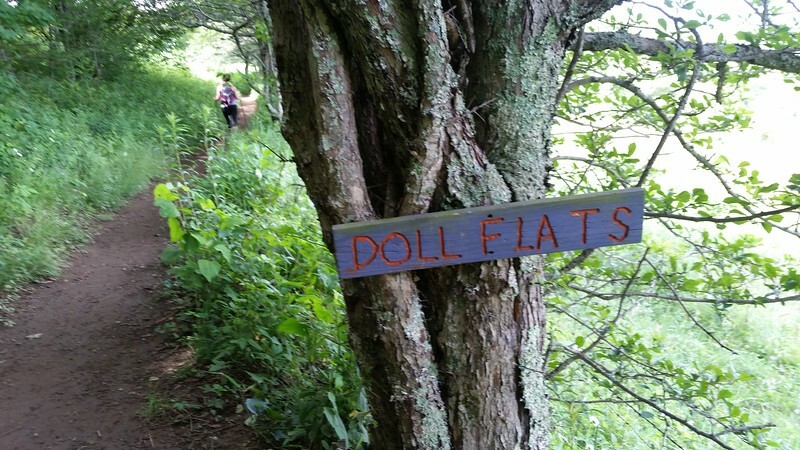 Night two is spent at Bradley Gap or doll flats. .. The last couple of years they have done some good work on the downhill to 19e. It's not as much of a toe pounder as it used to be.